The Maid is an intriguing little film. I went into the screening thinking that this might be a film with a twist. I’d flicked through a couple of reviews that clearly missed the point. There are no sudden narrative twists – although there is a narrative that isn’t predictable. The titular character is Raquel, who at the beginning of the film has her 41st birthday when she is given presents by various members of the family for which she has worked as a maid for more than 20 years. But we gradually realise that Raquel is not well. She has headaches and takes pills. She seems to be getting grumpier and is displaying classic symptoms of passive-aggressive behaviour. Pilar the university teacher mother of four children and wife of Mundo thinks that Raquel needs a rest and attempts to hire a second maid to help her run the household. 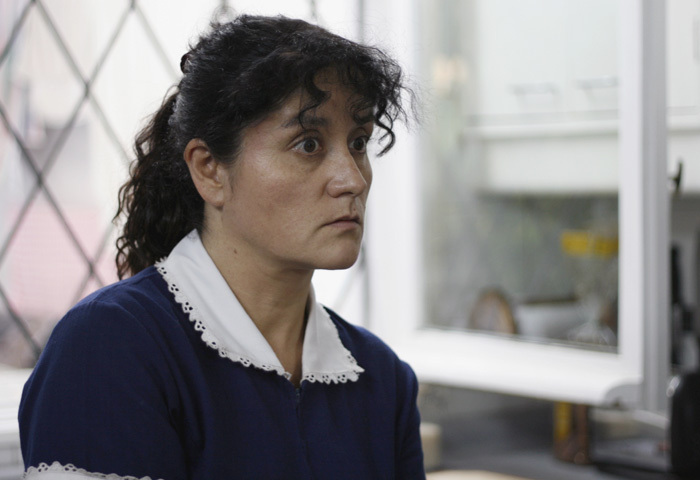 Raquel resists and when a Peruvian young woman is hired, she determines to get her out. I won’t spoil the rest of what happens – only say that the events are not always predictable. Since I saw the film, I have looked at some other reviews and one of them mentioned Chabrol. Certainly when I was watching La Nana I did think of Chabrol’s La céremonie (but not the violence in that film). I know little about Chilean society, so I must go on a general impression of Latin American Cinema in classifying La Nana as a drama about social class in some way. It’s a subtle film and Catalina Saavedra as Raquel offers a sensitive and nuanced performance. The obvious reference point might be Luis Buñuel and the films that he made in Mexico, but I’m not sure that is helpful here. The bourgeois family are quite modern with a modern attitude to employing workers. They don’t behave in a particularly obnoxious way and apart from sneaking off to play golf and owning a swimming pool, Mundo isn’t particularly decadent. These are modern professionals with the casual callousness of the liberal middle classes, but no malice towards house servants. The film is very claustrophobic. Raquel leaves the house and its gate and high walls only four times in all. The film is shot in a handheld style probably on digital (the director says that he cut red out of the palette as it doesn’t work on digital) and the look is clean and bright. The success of the film is in developing a representation of a particular kind of working-class life that isn’t necessarily physically hard or even particularly underpaid. Instead, Raquel has given up a private life (and any romances) and invested her emotional energy in her employer’s children. Her birthday and her phone calls to her own mother now seem to weigh heavily as she contemplates her future. I wouldn’t want this to sound like a miserabilist film, because it isn’t. It’s a superior psychological drama that is well-directed. This entry was posted in Latin American Cinema and tagged Chile. Bookmark the permalink. Old Cats was reviewed in Screen International this week.